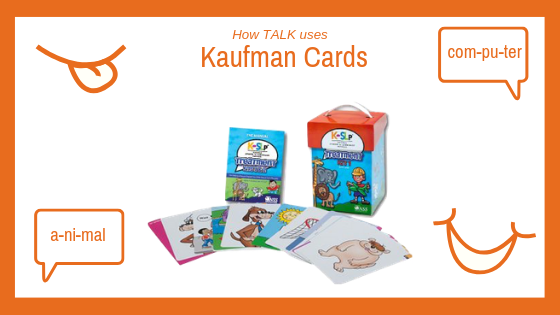 Kaufman Cards were developed by Nancy Kaufman to help children with motor-speech difficulties, such as Apraxia of Speech, approximate functional, real words. The cards colorfully depict early target words and are hierarchically divided. We start with a simple consonant-vowel combination like “baa” and slowly progress to harder combinations like “banana.” Each card also has shaping suggestions to ensure kids are successful and feel good about their speech. Saying, “bottle” might be too hard, but saying, “bah–o,” or “bah-do” may be a “just-right” challenge. We love using Kaufman Cards because they’re great for helping kids feel good about their speech and because they provide a clear hierarchy to help kids move closer and closer to real words. One of our SLPs recently used this tool with a child with severe motor-speech difficulties. When he started, he could only imitate a few consonants and vowels and was frustrated by his speech. Using Kaufman Cards, we taught him to combine consonants and vowels to say functional words like, “me,” “up,” “out.” He now loves using his voice to communicate his wants and needs with his family! We highly recommend this fun and useful tool if your child is struggling with early speech.